Thanks go out to Bandai Namco Entertainment for sending Family Friendly Gaming a digital download code for NARUTO SHIPPUDEN Ultimate Ninja STORM Legacy on the Xbox One. This contains four games in it. The four games are NARUTO SHIPPUDEN ULTIMATE NINJA STORM, NARUTO SHIPPUDEN ULTIMATE NINJA STORM 2, NARUTO SHIPPUDEN ULTIMATE NINJA STORM 3 FULL BURST, and NARUTO SHIPPUDEN ULTIMATE NINJA STORM 4 ROAD TO BORUTO. These are not just ports of these games either. Each of these games have been remastered in HD. So they look better than they did on the older systems. The installation took some time with NARUTO SHIPPUDEN Ultimate Ninja STORM Legacy. The final file size of all four games combined is 55.7 gigs. So make sure you hard drive has enough space to handle that much. Family Friendly Gaming has reviewed most of these games in the past. The issues families can have with NARUTO SHIPPUDEN Ultimate Ninja STORM Legacy is violence, blood, bad language, lack of attire, enticement to lust, sexual comments, false gods/goddesses, and more. There are normal fighting levels and there are also quick time events in NARUTO SHIPPUDEN Ultimate Ninja STORM Legacy. I love being able to hear English voice acting. Bandai Namco Entertainment could teach certain other companies how to do that if you catch my drift. There are some giant beasts in NARUTO SHIPPUDEN Ultimate Ninja STORM Legacy that must be fought with and against. Do not expect them to go down easy either. Most characters in NARUTO SHIPPUDEN Ultimate Ninja STORM Legacy have multiple health bars. I love the story telling in NARUTO SHIPPUDEN Ultimate Ninja STORM Legacy. There are also special effect sounds that fit this franchise perfectly. The first game is not very good about giving the player direction. The final three are much better. It is cool to see how the franchise improved across releases as well. NARUTO SHIPPUDEN Ultimate Ninja STORM Legacy got me interested in watching the Naruto anime. NARUTO SHIPPUDEN Ultimate Ninja STORM Legacy contains local multiplayer and online multiplayer. One of the games (sorry I do not recall which one) included an user license agreement. If you troll others then you can be blocked from playing online. I do not know what happens in the instance of a false accusation. I am unaware of an appeals process. If you like ninja fighting video games then you could get into NARUTO SHIPPUDEN Ultimate Ninja STORM Legacy. I love how there are four games included in this package. I hope more companies will release compilations like this one in the future. 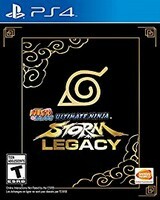 There is a physical copy version of NARUTO SHIPPUDEN Ultimate Ninja STORM Legacy available for families.